I want to be fit and strong and healthy. I wrote about this early last month, so I’m not going to go over all of the details, how I will do this and why again here. I am thrilled to say that I’ve found that I absolutely love cycling! I started off in mid-February with a quick ride around our block (this was about a five minute ride). Then I got braver and rode five kilometres (three miles). Slowly I’ve added to the distance and now I’m riding thirty kilometres (about nineteen miles)! I can’t believe how quickly my fitness has increased and I love the new levels of energy I have. I ride through a nearby industrial area to a bike track that goes for about 45 kilometres (28 miles). It is really beautiful (well to me) as you can see from the video below. It is refreshing to get out and ride. It clears my head like no other physical activity has done. Being able to do 40 kilometres (25 miles) by the time I go to Thailand is definitely achievable. 1. Wind is awesome – so long as it’s behind your back. 2. Hills are spectacular fun – so long as you are going down them. 3. If you need to walk for a bit, limp a little – not only will you gain sympathy from passers-by but they will think you are a complete legend when you get back on your bike. 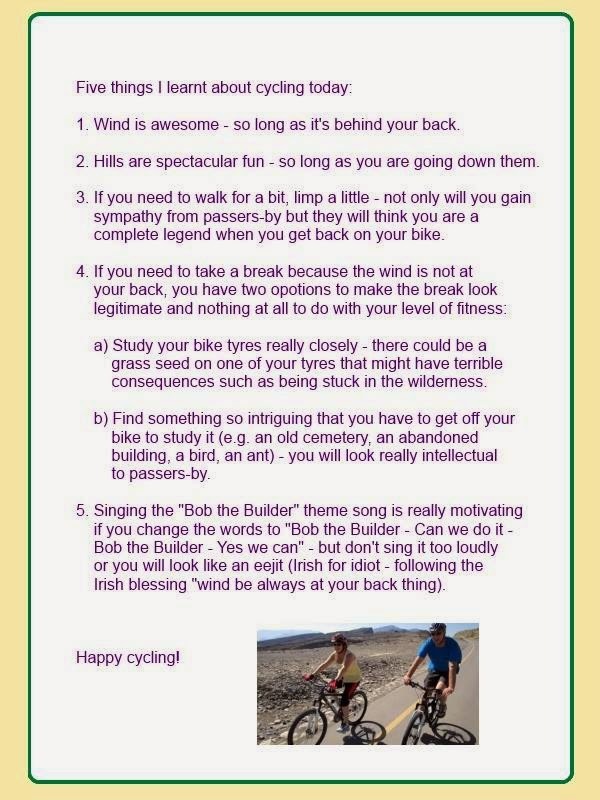 a) Study your bike tyres really closely – there could be a grass seed on one of your tyres that might have terrible consequences such as being stuck in the wilderness. b) Find something so intriguing that you have to get off your bike to study it (e.g. an old cemetery, an abandoned building, a bird, an ant) – you will look really intellectual to passers-by. 5. Singing the “Bob the Builder” theme song is really motivating if you change the words to “Bob the Builder – Can we do it – Bob the Builder – Yes we can” – but don’t sing it too loudly or you will look like an eejit (Irish for idiot – following the Irish blessing “wind be always at your back” thing).